German think tank Agora Energiewende has produced a paper showing the lack of transparency for grid data. Proponents of distributed renewable energy have complained for years that they cannot verify the need for new grid lines. Craig Morris explains. Getting your head around the German grid debate is not easy. On the one hand, we have professional studies showing where new high-voltage lines need to be built – allegedly specifically for the energy transition. On the other, we have critics of those plans. They are often accused of NIMBYism, but many of them are actually not only supporters of the Energiewende, but also deeply involved in their own renewable energy projects. What separates the two camps is a different vision. Those calling for more grid lines want large solar and wind projects in the sites with the best weather conditions. The other camp believes such a situation would concentrate ownership in the hands of big firms; they therefore want to build projects themselves everywhere and decentralized and do without new grid lines. Daniel Bannasch is a campaigner for local, citizen-owned renewable energy projects. He is also the head of MetropolSolar, an energy co-op based in the German city of Mannheim. When I met him recently at the Intersolar tradeshow in Munich, he pulled pieces of paper out of his pocket. On it, he had scribbled mockups of a number of charts. He uses them to explain to people why Germany wouldn’t need grid upgrades if it focused on distributed energy. One message in the charts shows the rise of electricity in overall energy demand as heat and mobility are electrified. “We need to look at the energy transition from 2050,” he says. “We will need to store excess power as heat, for instance – why don’t we start this now? Why do we insist on transporting this electricity across the country with new power lines?” He argues that power-to-heat could be started now where wind power is available in excess; it then would not have to be transported elsewhere. People like Bannasch have criticized the grid studies produced in Germany for being a wish list. The grid operators themselves determine demand, and practically no one else has the data needed to verify the findings. It is the job of Germany’s Network Agency to regulate the grid, including confirming the need for power lines. And that’s what makes the lack of transparency all the more disappointing. What transparency looks like in plans for upgrades to the German grid. Source: Bundesnetzagentur via Agora Energiewende. 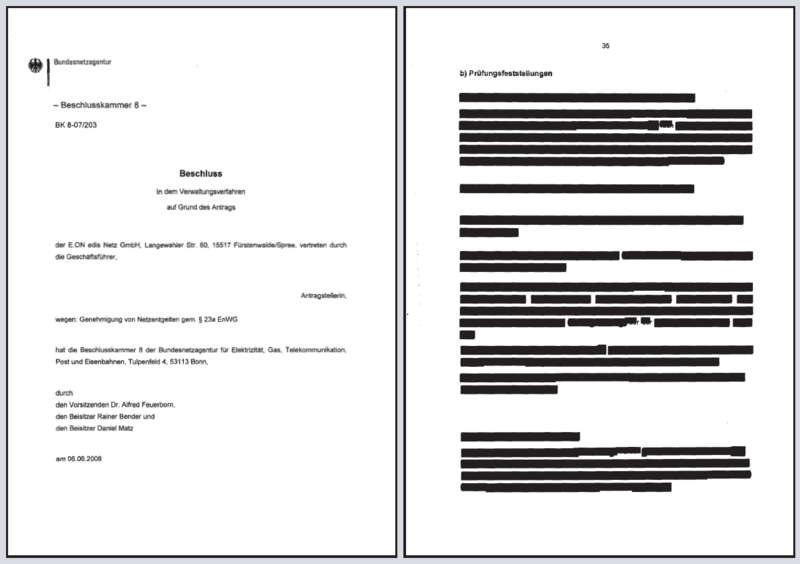 The Agora study (PDF in German) reveals that large sections of documents made available to the public are made confidential. Firms provide the Network Agency with information they do not want their competitors to have. Behind the black lines are trade secrets – nothing scandalous, but the extent seems excessive. Of the 481 decisions made by the Network Agency and investigated in this study, only 57 were even published, and all of them had been redacted. Agora argues that more information could be made available under current law. Furthermore, the paper argues that, while trade secrets do have justification between competitors, German transmission grid operators are regulated monopolies who do not compete with each other. Other countries have far greater transparency when it comes to grid data. The result could be a more open discussion about which power lines are needed for what reason. Germany could then move beyond charges of NIMBYism to talk about actual options. The official line is that we need new big power lines for the Energiewende, to bring wind from north to south. The truth is, that the first lines link the brown coal open cast mining sites (with respective brown coal fired power stations) in central Germany (west and east) to former nuclear power stations in the south. The official line is that from there they will move north to the coasts of North Sea and Baltic. The truth is that the western line ends in Emden. And by pure coincidence RWE is just finishing a coal fired power station (1,600 MW) across the river from Emden in Eemshaven that runs on imported coal. You do not normally see this power station on German grid maps: It is located just across the border in the Netherlands. Just as renewables, a grid serving renewables has to be organized bottom-up. So let us take care of local, 20kV, 110 kV grids first, then move up to higher things, if necessary. Subsidiarity does apply here. And yes, ultimately we do need a decent European grid that helps us balance demand and supply across Europe. From my perspective in the Southwest this means improving connections to France, Switzerland, Austria and making them useful for renewables: three countries with plenty of storage capacity in case we have a surplus from wind, solar or bio in Germany’s south in, say, twenty years or so. The North-South interconnectors are working very well. Nothing blackened out, even Poland has a little bit more power today.